My friend Sandy had just died, and I was terribly sad. Sandy was one of the first women I became close to as a metster. Sandy and I had been diagnosed around the same time, or maybe she was ahead of me, I no longer remember as she's been gone a few years. We became online friends, very good friends, very quickly. After the first "reach out," we spent all day chatting with each other - hundreds of messages. Day after day. It was natural and intense. When she died, I was very sad, and missed her a lot, and posted about it. The first time I remember Vickie Young Wen was when she reached out to me in friendship. She acknowledged my loss and offered to chat with me the way I had with Sandy. I had known of Vickie already, probably had talked to her although this was the first conversation that stuck. I liked her, but I thought, for me, she might be a bit ... nice. I knew about her love of God and her desire to live by religious principles and as you may know by now, I am an atheist who has no interest in changing. I may have stereotyped her as the type of Christian who feels they must convert me, and while I totally respect everybody's belief system, I also want mine respected too. I also am up for a bit of snark in my private conversations, or was. Sandy and I had humor that was a bit twisted by normal standards. I thought Vickie might be too serious. I believe, as honest as I am, I even shared those sentiments with her. 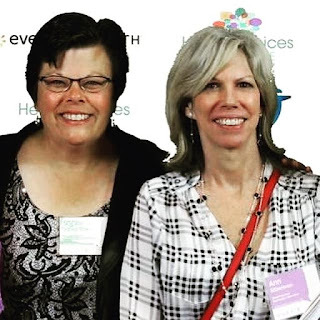 Looking back, of course, I think the truth is I wasn't ready for another friendship revolving around metastatic cancer as I was still grieving Sandy. After all, Sandy and I didn't have gossipy or negative conversations, just a bit of gallows humor. We only talked about our lives living with this disease - and Sandy was also religious, in the Jewish faith, one I guess I'm more comfortable with. (Psychologically, I know why - my Christian mom made me go to church against my will - a non-believer from the start - and my Jewish father never mentioned religion). Vickie did not take my veiled "I'm not ready" as a rejection. She seemed to understand. She had read my blog and had a sense of who I was. She started chatting with me online, just chit-chat, about pink, etc. I responded because I usually do, and it was at a time when I spent most of my time in front of a computer. Conversations got deeper, and then, she made overtures to meet in person. She was once in Sacramento and wanted to meet, but it was a time I had something else going on. And, it wasn't an important thing; to my everlasting regret, I could have cancelled whatever it was. I just didn't feel like meeting anybody. But I'd given her my address and when I came home, I found a little package from her on my doorstep, an item I have kept. She kept communicating, I kept responding. We sent some cards and things to each other and I started to consider her a friend, practically against my will. She came to my city again and this time we met. We spent a sunny day having coffee and cake at a bakery and doing a bit of shopping afterwards. She was funny, we had a lot to say to each other and were able to share exactly what living with this disease is. We talked about our families (both of us are full of love for them) and shared our mets stories, all those details you can't share online. We just talked. Now that I considered her a good friend, we began talking online more frequently, and she and I both were on the same page about pink, of course. She began writing about it more intensely and sometimes asked me to proofread things before she posted them. She was such a good writer, she didn't need help. I wanted to do some public online video chats with her and another woman and Vickie was into with the idea, saying she would make the 2 hour drive to come to my house to start right away. It never happened... but it's because of me. I had excuses: my house wasn't clean enough and what if she lived in a really nice one and would look down on me for mine or what if the dog jumped on her and hurt her and mainly, I was too tired.... I was always so tired. She had more passion for education than I do, that is clear. But to my credit, a big consideration in saying "not yet" was that I didn't want her, with her diseased bones, to sit in the car for two hours to get here, when I hadn't thought out what exactly would happen yet. I did worry about her ignoring her disease and going too fast. Vickie had a ton of energy. She was diagnosed with bone mets after my liver mets diagnosis, in 2012, I think, but despite her having more disease, I was always the sick one. I was always stunned that she had no pain, when I live in pain. How is that possible? She had buckets of life and never seemed tired. She was passionate about educating people about pink and mets. In her vibrant way, she found many niches of support and friendship. She was involved in a group of woman from Australia who gave her a lot of comfort. She talked about them often. She came up with the tag that I now see a lot of women using #Iwantmorethanapinkribbon. She named her blog that. I thought it was too long and would never be a hashtag people used. I was wrong, she was right. I was on the panel of a group of health advocates from different disease areas sponsored by a pharmaceutical company, and I was asked to invite breast cancer patients in social media to their first ever conference. The first person I thought of was Vickie. She had just started her blog (although her CaringBridge had been around a while) but I knew that she would grow it quickly and had a lot to say and I thought this conference might help her say it effectively. Thankfully, she agreed to go and we met again, this time in New Jersey. We spent most of the time together. She took advantage of being back east and after the conference, took her son on a trip to New York, so I got to say hello to him. Her children are both still in high school. She was intensely and incredibly proud of them and her husband Art as well. She spoke highly of so many people, I couldn't list them all. She had a PCP physician as a friend, and researchers, educators, and many metastatic patients. Every October, she put out information for the masses. One year, she posted every day in October a myth about breast cancer and educated thousands with her 31 posts. When was the last time I saw her? It couldn't have been only twice, could it? She was such a presence in my life that I can't believe it. My memory is shot and my old phone is dead, with all photos. Only these two exist. So I don't know, but what I do know is whoever invented the term "force of nature" must have met Vickie. I guess I didn't need to see her to believe she was around. She was always in my thoughts. She, of course, did not replace Sandy. I've learned that it's not about replacing people. Each has their own space in our hearts, and that space is infinite. She just became another close metster friend, one who I could share the hardships of this disease with. Then ... I took her for granted. At some point, I needed a break from mets. I was feeling really good and just wasn't into being online and hearing about cancer. I stayed in minimal touch with my group, and I touched in with her, but not frequently, I could go a couple weeks without talking. She told me she wasn't doing well, that cancer had entered her brain. She had infections in her eye, and episodes of pain. I told her she'd survive it. I knew many who had, and Vickie? Vickie was the healthy one, she wasn't going to die before me. She was certainly going to see her kids graduate from high school, as I had done. She was going to live ten years with mets. That has been my plan, but it never was hers. She, practical woman, did not allow herself that denial. Our long conversations ended, and I barely noticed because I wasn't spending time online, and then, my iPhone died all while she was getting sicker. Because my phone crashed, and it took a month to get a new one, and I lost passwords, I could not log in to her Caring Bridge site, although I tried. (At the end, I made a new account so I could read it.) Although I knew of her problems, I also read about her latest PET scan that she said was good, that there was only a tiny area in her brain and her spinal mets were the same as they had been. That's what I hung on to, ignoring the decline in other areas. October 3rd, she showed me a photo of a pen she made, like the ones I've sold. A crafter, she found the pen seller and made her own. It was gorgeous. Our last back and forth conversation, on October 10, was just about an acquaintance of ours (and one who I also invited to the conference and wanted to do the talks with). She had been diagnosed with mets too, lived several years on chemo and then discovered, unbelievably - astonishingly - that she had sarcoidosis and not cancer, just like a House episode. I messaged Vickie and asked if she heard and said how wonderful and remarkable it was, and Vickie said, "I can't even imagine the burden of death being lifted from her...wow. Such good news." It was so fitting that the last thing she said to me was how happy she was about somebody else's good news. That, in a nutshell, is Vickie. The sad thing for me was that we acknowledged death together. Talked about it many times. And when it was near, I denied it could happen to her. I didn't want to think it. She didn't think she would die right away, of course, or she wouldn't have made her pen. But she was sick. And, it became apparent the last two weeks, and she was told that she was unlikely to come out when she went into the hospital. (She did get to die at home, with her family at her side). She knew things weren't good but I didn't believe, after all our reality. She used the phrase dire. The last thing I said - exactly one week ago - was "What is happening friend? What is dire?" Another friendship gone. Again, I am standing alone in this disease, surviving when my friends all die. I've been five years a metster. Seven years with this disease but five years living with the knowledge my time is short. But I am able to pretend that isn't the case, and I make friends in my situation. And one by one, they die. I know that it will be me, too, and each friend I lose makes me feel closer to death. Vickie was bright, eager, incredibly intelligent. A natural educator and a born leader. Enthusiastic, full of ideas and energy. A woman who loved her life, who loved her family and knew how important it was to be friends with people, and knew how to win them over. She talked a lot out of sheer knowledge and hugged a lot out of love. It is astounding to me that she is gone and I'm here. She made me her friend, would not let me go. Now, I have to let her go. My heart, my love, my wishes for peace to to her husband, her children, her mother in law and all her friends. Know that she told me about you in the most loving way possible. I know that there are many people all sharing their pieces of Vickie all over the internet and in homes. Some of them may sound unlike the Vickie that others know. That is the beauty of humanity, how we can come together and share parts of ourselves with different people, and it makes a beautiful whole. She was such a good person, and taught those who would listen so much. The world is surely a sadder place for her being gone. Life goes on, I have a friend from Utah visiting me. Please forgive this hastily written eulogy and any typos, as I don't have time to write. I hope that my love comes through loud and clear, badly written as it is. Oh, Ann I am so sorry for your loss. I empathize with your feelings about this. Friendships have such variable seasons and times. The good and great ones know how much you care and that you can pick up right back where you left off.. even if you are at different stages of the cancer or mets process. We get busy with other things, or try to catch up on all we got behind on when we were sick, or just choose to not deal with sickness for a while. None of that means we don't love, care and support each other. I'm so sorry you weren't able to communicate with Vickie before she died. Your post was a beautiful tribute to her life and your very realistic friendship. hugs! Always about you. Your "tribute" is just you twisting it to be all about you and how wonderful YOU are, how much sicker YOU are and how she rode on YOUR coattails. But I guess anything to stay relevant right Ann?? Wow. Harsh. It was my memories of how we met. Relevant to what? I'm only trying to live my life as long as I can. I truly don't understand that comment. Wow, harsh is right. I thought this was a beautiful tribute as well as a critical reflection of yourself, imperfections and all. I am so sorry for your loss, Ann. Just read that rude comment by Anonymous, who is too cowardly to identify him or herself. What a mean person. Vickie was an incredible woman. I often wondered where she got her energy. She seemed to be a dynamo. I'd thought she'd be one of the ones who defies the expected longevity of a metster because of her boundless energy. It was a little over a week before her death that she posted a photo of herself and a friend after getting pedicures. Vickie lived very close to me. We talked about meeting, but for many reasons, it didn't happen. I loved Vickie's intelligence, candor, and heart. She will be missed. I've posted here a couple of times as Anonymous, but that post is NOT from me. I am shocked that someone could be so cruel. Wait, we are living in TrumpWorld now, I shouldn't be shocked, but I am. Whatever happened to common decency? Ann, I am saddened by the loss of your friend. Your tribute to her and your friendship is beautiful. I find something divine in people who know they have only so much time left and yet are willing to invest that time in a friendship which may also be limited. That takes a special kind of courage one doesn't find everyday. We hope to find that in our spouse who vowed to love and cherish us through sickness and in health. To find a friend in sickness who will stick it out with you without any vows is truly special. I am so very sorry for the lose of your friend. I just wrote about my sister on my blog and I know she's not out of the woods, but I cherish every minute wit her as I know your friend did with you. She is no longer suffering, but a whole woman! Thank you for this... beautiful. I will miss Vickie too. You continue to inspire me. Thank you.